Metal Gate Door House Hinges and Handles are very decorative and easy to use to decor the door. Made of premium metal and black powder coated provides rust resistance and fingerprints resistance to make it durable and sturdy even outdoors. Handle Size: Total length: 28.5cm/11.22". Center hole length:19.2cm/7.56"
High Quality Steel and Frosted Black Surface. Decorative looking and easy to install. Smooth and elegant, modern design. Premium Quality: The door handle and gate hinge are made of high quality metal and the frosted black surface provides rust resistance and fingerprints resistance to make it durable and sturdy. The handle and hinge with coating surface promises smooth touch and a great feel in your hand. Universal and Multifunctional: The black garage hinge and handle pull are perfect for both interior and exterior doors, gates, garages, barns, sheds, closet. The modern design fit for any style for your doors. 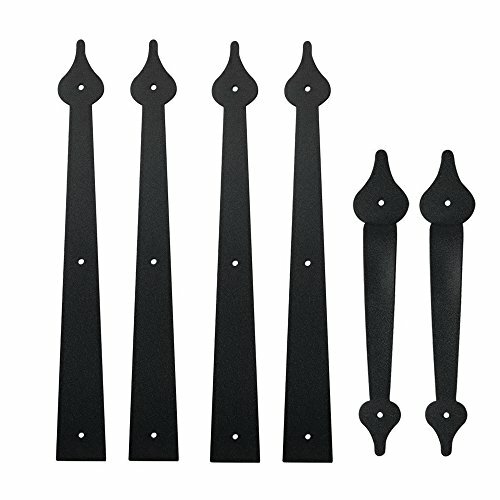 Easy Installation: Easily and quickly to install on various wood doors and gates with included hardware. Hinge size: L 16.14"(41cm)*W 1.97"(5cm). Handle Size: L 11.22"(28.5cm)*W 0.98"(2.5cm)*H 1.58"(4cm), the thickness is 0.15cm(0.06"). Matching black powder coated screws are included . Package include: 4*Hinges, 2*Handles, 16*Mounting Screws. If you have any questions about this product by LWZH, contact us by completing and submitting the form below. If you are looking for a specif part number, please include it with your message.